▲ The GSC is holding a press conference demanding for the truth to be told regarding President Han's plagiarism. 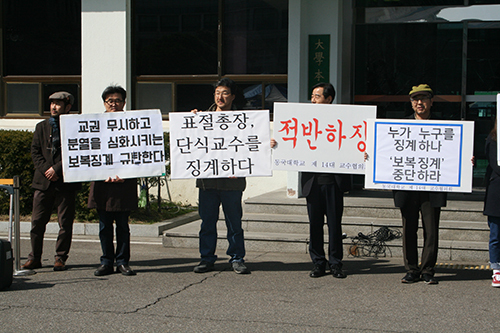 On May 17th, in front of the Main Hall, the General Student Council and the chairperson of Student Council of Postgraduate held a press conference regarding the questions raised about the doubts on the plagiarism of President Han Tae-sik’s doctoral thesis. There has been an inquiry of plagiarism from the president’s thesis beforehand, and it is now again in the limelight with his doctoral thesis. In the next following hour, the school held a press conference in the Lotus Hall. Vice President Yang Young-jin hosted the conference to answer the questions from the previous conference. After reading the answers, he showed one document as an evidence. The document was the response from Bukkyo University where on March 24th 2015, the school requested to verify if the president had plagiarized a paper of Etani Ryukai, the former president of Bukkyo University, for his doctoral thesis. However, the university replied that since the doctoral thesis was written over five years ago, it cannot be investigated.